"They were all killed! All of them! Dead." Come and See (Idi i smotri) follows 15-year-old Florya Gaishun (Aleksei Kravchenko) as he joins the Byellorussian Partisan resistance that struggled against Hitler's invading forces in 1943, without the help of the Red Army. With no uniforms, communication technology, or standardized weaponry, these Partisan bands (otriad) fought to dent the Axis war machine's hide as it churned inexorably across Belarus, burning hundreds of villages and killing most of the inhabitants, women and children included. During the course of his travels, Florya meets a beautiful young girl named Glasha (Olga Mironova), an intense but selfish Partisan commander (Lubomiras Lauciavicus), and the Nazis themselves at extremely close range. Director Elem Klimov approaches his subject with poetry and violence in equal measure�pastoral shots of a mysterious whooping crane and a young girl dancing in the rain are mixed with unexpected gunfire and massive attacks from above, and the personal, vengeful pain and apparent futility of the Partisans' mission is never far offscreen. Klimov's visuals are tremendously effective, lending a slightly fantastic aura to the movie that turns nightmarish in an instant. Dialogue is limited, with many key moments played out across Florya's still-forming adult features; there's a profound sadness here, as he ages dramatically over the course of the story's events. Kravchenko brings a naivet� and a commitment in his debut performance that seems to transcend the filmmaking process, and Klimov's frequent use of the Steadicam brings the audience very close to Florya's experiences. The supporting cast members also deliver subdued, naturalistic acting, even those cast as the Nazis�Klimov and his actors depict the outrages large and small perpetrated under Hitler's twisted philosophies without making them seem cartoonish. Klimov also depicts the dehumanizing aspects of any armed conflict with subtlety and honesty. 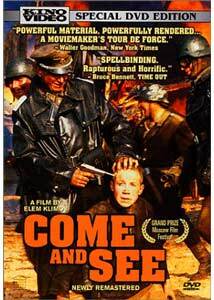 It's difficult to discuss Come and See in any detail without revealing its often-startling plot developments. Let me just say that this Russian film, rarely seen outside the former Soviet Union, brings a unique and well-executed cinematic perspective to a part of the global conflict we call World War II. And it's a perspective well deserving of exposure. Image Transfer Review: The film is presented in 1.33:1 full-frame format, which appears to be the original aspect ratio�no cropping or matte-aware compositions are in evidence, and the Soviet movie industry may have retained the Academy ratio for an extended period. The transfer, unfortunately, appears to have been drawn from an older laserdisc master�analog noise and smeariness is frequently apparent in complex backgrounds, edge enhancement is common and the transfer is rendered at 30 frames per second with 3:2 pulldown. Darker scenes exhibit significant amounts of detail-obscuring grain, and a new film-based transfer would have been an improvement here, as bandwidth limitations should not have been an issue for this two-hour and 15-minute movie spread across two dual-layered discs. Audio Transfer Review: Come and See is presented with new Dolby Digital 5.1 soundtracks in original Russian and dubbed English and Arabic languages. The original soundtrack elements recorded for this 1985 film must have been well cared for, as the 5.1 "remix" never sounds gated or otherwise electronically dragged into the world of Surround Sound. There are a few gimmicky surround effects, but in general the film sounds as though it was always in DD 5.1 (though bass content is weak). Most of the sound effects and dialogue were looped in after production, which gives the film a clean audio presence at the expense of some poor lip-synch here and there. I listened to the Russian track primarily, but the English and Arabic tracks have a similar presence. I did note a technical error, in which an English surround channel turns up on the Russian track�a bit disconcerting to hear English voices suddenly emerging from the background, echoing the subtitles onscreen! It's nice to see Kino supporting 5.1 audio when available (a frustrating omission on some of the studio's earlier releases). Three videotaped interviews of recent vintage and considerable substance are included here. A 21-minute Preface provides an introduction to the film, with some commentary-esque memories from director Elem Klimov as he recalls the 7-year Soviet movie production cycle, film shortages and other complications; a 13-minute interview with grown star Aleksei Kravchenko, who contributes his recollections of casting and production at the age of 15; and a 7-minute interview with production designer Victor Petrov, who discusses the film's achromatic, subjective look, Steadicam use, and live bullets and explosions. A hidden fourth interview link (in Klimov's filmography) leads to a 4-minute piece on his film, Agony. Two harrowing documentaries have been assembled from silent, black-and-white footage shot in Byellorussia in 1943, with new narration. Partisans in Belarus describes the arm of the Nazi forces that pillaged and burned its way through the peasant state, and the ragtag "partisans" who took up any weapons and armor they could find to resist the invasion (the Red Army being nowhere in sight). Nazis' Brutalities includes extremely graphic footage of some of the corpses among the many who died as 626 villages and their inhabitants were burned (women and children included); this brief segment plays like a newsreel that becomes uncomfortably intimate, an unforgettable experience. Two separate photo galleries include 12 color stills from the film and 9 black-and-white behind-the-scenes stills, all presented in the 1.33:1 aspect ratio. Brief but informative filmographies provide some background on 5 members of the production crew and 5 of the actors. Come and See presents a unique perspective on World War II in the rarely-told story of Nazi atrocities in Byellorussia and the ragtag Russian partisans who resisted Hitler's forces. Kino's DVD features a middling video transfer, but supplements are strong and the film deserves a wider audience. Recommended.